Surfing Heritage & Culture Center: A Very Modern Piece of Equipment! This 5'5" x 20.5" x 2.5" planning hull was designed and built by Dane Hantz of Vulcan surfboards, San Diego, CA. This board is a representation of current trends in small wave design, intended for nimble performance in average California conditions. The construction however, represents a departure from the typical methods and materials used in the surf industry. Most notably, this surfboard has no internal wooden stringer, rather the design gains its structural integrity from the elliptical corrugations seen in the deck. The glassing schedule uses a vacuum bagged plain weave carbon fiber over a 1.9# recycled EPS core. The use of carbon fiber allows the lowest material use when compared to fiberglass while achieving a greater mechanical longevity. The end result is a board which is not only as strong as traditional surfboards but drastically lower in weight. Donated by Vulcan, this board will be the "end cap" to our "Evolution of Surfboard Design" timeline, which is currently being redone. We'll be moving the early wood boards to the left side of the showroom and incorporating some of the other items we have; trunks, shaping tools, photos, wetsuits, etc., in order to tell a more complete story of the history of surfing. We'll also be breaking it down into eras of surfing, so be sure and come for a visit to see how things progress. 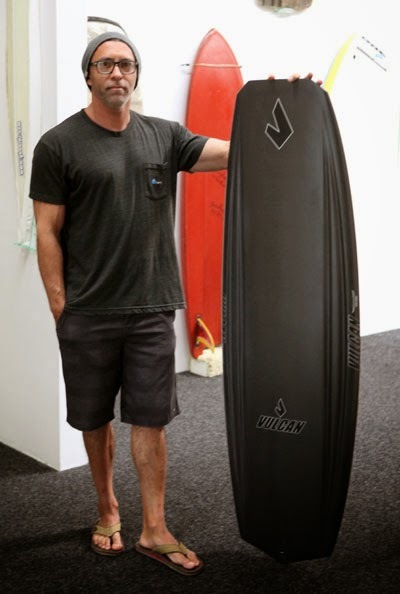 To learn more about Vulcan Surfboards, visit their website by CLICKING HERE.